“The beauty of her hand, the delight of seeing through her eyes, the little bits inserted between the pages or pinned to the leaves. Reading through the journals was a treat beyond the academic. 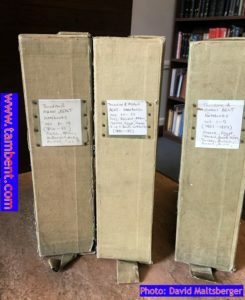 Thank you for making the journals more widely known…” Mabel’s ‘Chronicles’ in their three storage boxes within the archives of the Joint Library of the Hellenic and Roman Societies, Senate House, London (review and photograph kindly provided by David Maltsberger, December 2018). 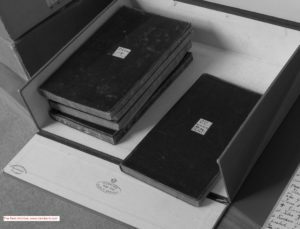 Mabel Bent’s Chronicles: an irregular series of extract posts from her travel notebooks held in the Joint Library of the Hellenic and Roman Societies, Senate House, London, and transcribed by Gerald Brisch. Printed editions of Mabel’s Chronicles are available from the Archaeopress Online Shop. Read on! And if you enjoy Mabel’s Chronicles posts, why not sign up to receive future ones via Facebook, Twitter or email, and tell your friends! Become Bentophiles and join them on their travels in the Eastern Mediterranean, Africa and the Near East. 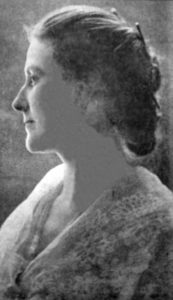 By ‘notes’ in the Who’s Who extract above, we are perfunctorily introduced to the extraordinary series of notebooks Mabel diligently kept for the fifteen years or so that she and Theodore travelled together in the Eastern Mediterranean, Africa, and the Near East (1883-1897). She called them her Chronicles and what follows, by way of a little background, is taken from the Introduction to Gerald Brisch’s edition of Mabel’s notebooks (© Archaeopress, Oxford, and Gerald Brisch, 2006) covering the Bents’ travels in the Eastern Mediterranean. In the fifth decade of Victoria’s reign, two paths brought together an indefatigable Anglo-Irishwoman of means and an Englishman of mettle; on the second of August 1877 they married. The newly-weds, she thirty-one, he twenty-five, moved to live in London, a stone’s throw from Marble Arch, at 13 Great Cumberland Place, W., and within a few months the couple were off on a series of inseparable, breathless, annual trips that were to continue until, twenty years later, on the fifth of May 1897, the Englishman, an ‘archaeological adventurer’, died from malarial complications, and Mabel Virginia Anna Bent found herself once more on a solitary path, left with her memories and an assemblage of travel Chronicles, that she ‘always wrote during their journeys’ (and which are complete except for the account of the couple’s adventures in ‘Abyssinia’ in 1893) . 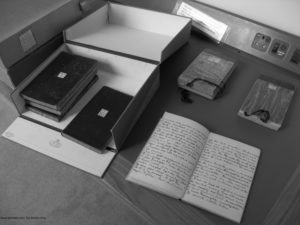 After her death, formidable and eighty-three, in 1929, these Chronicles in the form of two dozen small leather notebooks found their way into the archive of the Hellenic Society, out of the light and overlooked. These are the journey accounts of Mr and Mrs J. Theodore Bent. And what journeys. Sooner or later, today’s tourists who venture as far east as Karachi, south as Cape Town, west as Lisbon, north as Warsaw, will undoubtedly find themselves on a route once followed by the Bents. Before the invention of flight, they were amongst the the most-travelled husband and wife teams of their generation: the coverers of goodness knows how many equivalent circuits around the globe by ship, train, carriage and cart, on horse, camel, mule or donkey, and, of course, on foot. Thousands of miles under hot sun, nights under canvas, in regions where every other European might expect to have his or her life drastically shortened by illness or injury: as was the fate of Theodore … at the age of forty-five. And the reasons for all this effort and expense? Their objectives? The modern bibliographies that have to do with archaeology, anthropology, ethnography, botany, and other fields with similar suffixes, in regions from Abyssinia to Zimbabwe, are still very likely to refer to the articles, papers and monographs of Bent, J. Theodore, and, occasionally, Bent, Mrs J. Theodore. In addition they were alert commentators and observers, they enjoyed their food and drink, music, customs and costumes. They also felt they had a duty to minister to the sick as much as they could – with a great medicine chest full of arrowroot, brandy, quinine, and demijohns of Brand’s Beef Tea. They were fortunate; they were comfortably-off Victorians (their atlases were stamped the colour of their monarch’s soldiers’ jackets) and, blessed with extraordinary stamina, they had world enough, and time … before the great wars. In pursuit of their researches, their reputations increasing with each campaign, the Bents preferred to travel abroad during winter and spring, returning to London (and from there making shorter journeys to see friends and family around Ireland and the English countryside) for long, pleasant summers, and to write up their findings, lecture, and plan next season’s adventure. Mabel’s Chronicles provided Theodore with much of the background material he was to use for his monographs and articles. 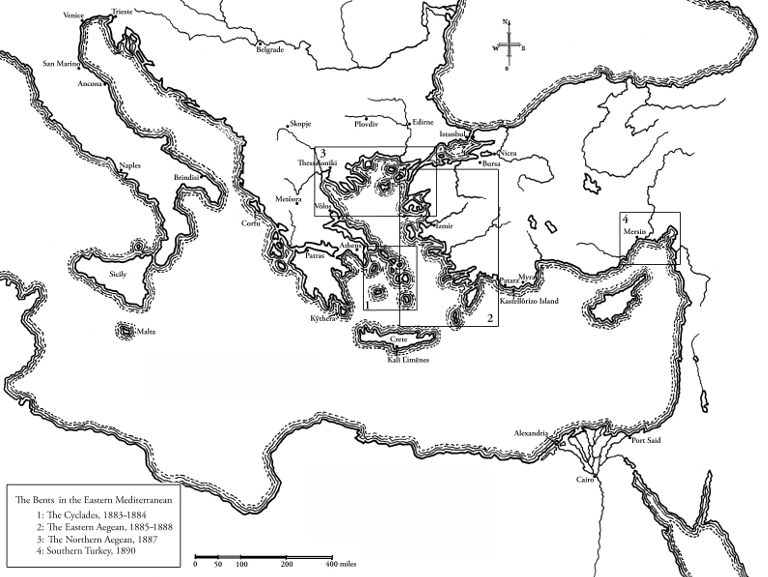 A look at his long list of publications brings into focus three concentric, geographical circles – the Eastern Mediterranean (Greece and Turkey), the greater continent of Africa, and the Near and Middle East. And this is how his wife’s travel Chronicles are presented. Well. Perhaps not everyone. Mabel’s Chronicles are not great travel literature. They are her on-the-spot recollections of long days spent trekking, exploring, digging, dealing with villagers, arguing with minor officials; they are snatches of gossip, snobbishness, likes and dislikes, barking dogs, vicissitudes, poverty and pain; they are delightful souvenirs of music, dancing, colourful costumes and wonderful meals. Great travel literature? No. But great travel writing – accounts of wonderful endurance and a reflection of courage, attitude, apogee of empire, and spirit – most certainly. Chronicles any of us, openly or secretly, might have been happy to write, had we but world enough, and time. You can read more about the issues and considerations involved in the transcription of the Chronicles. A few of Theodore Bent’s notebooks remain with his wife’s, still awaiting publication. Before we join Mabel in her travel Chronicle of the Cyclades, there are a few last-minute details to attend to. 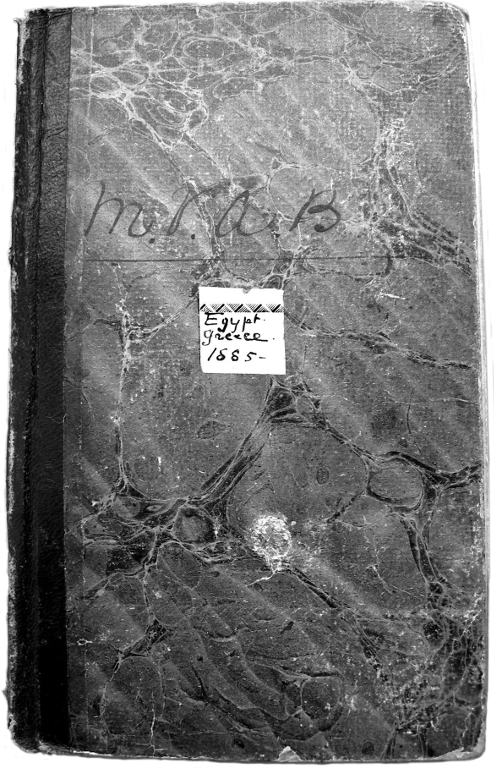 It is Mabel’s practice to refer to her husband as T throughout, and their Greek assistant, Manthaios (who replaces later the below-par Phaedros), as M. The first Chronicle is written in a lined and columned accounts book (£/s/d, of course); it has marbled endpapers and edges and measures 175 x 110mm. Mabel completes 94 of its 130 leaves. The book once belonged to Theodore and he has written in the back of it ‘J. T. Bent. Acct. Book. Oct. 13th 1871’. He would have been nineteen and about to enter Wadham College, Oxford. 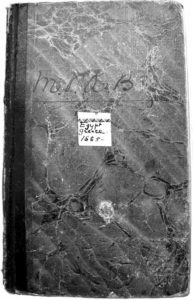 It is as if, just before they set out for their second trip to Greece in November 1883, one of the couple hits upon the idea that Mabel should keep a record of the trip, and a simple, dark-red leather notebook that has been lying around the house for twelve summers is the first thing that comes to hand. But from this inconsequential idea flows a fifteen-year stream of travel diaries unparalleled in their scope and addictive in their appeal. 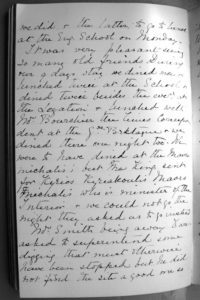 We hope you will enjoy the following, irregular posts of Mabel Bent’s travel Chronicles (all extracts, transcribed and © Gerald Brisch). © Gerald Brisch, September 2006 & November 2016. 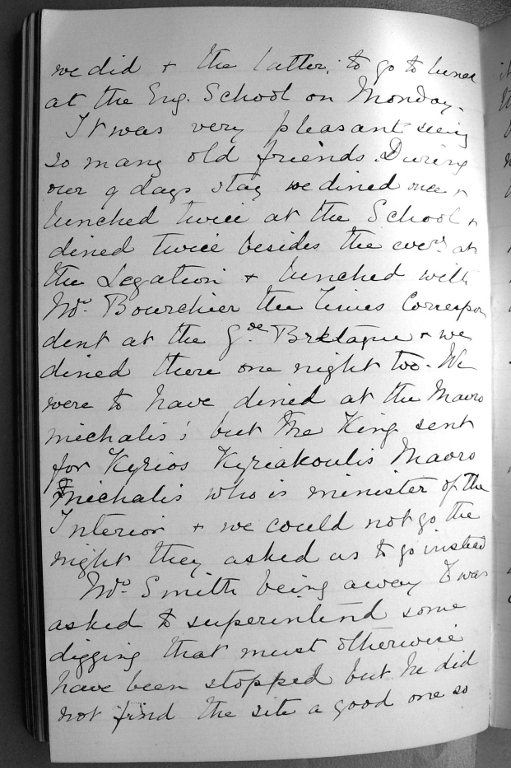 We can begin, at last, Mabel’s Cycladic Chronicle, her first, in Athens on Monday, 26 November 1883, at the Hôtel des Etrangers, or, you can view all Mabel’s Chronicle blogs that we’ve published to date.